Btcd + getwork + cgminer = profit | Conformal Systems, LLC. The getwork RPC has two modes. A request mode and a submission mode. The request mode instructs the RPC server to return data for the caller to work on. The submission mode accepts a supposedly solved block header from the caller and checks it for accuracy, adds it to end of block chain following the same rules as every other block, and relays it to rest of the network. The server validates the submission by following the same rules every other block is subjected to, adds it to the end of the block chain, and relays it to the rest of the network if validation was successful. Something you might have noticed in the overview above is the address to pay the generated bitcoins to is not specified. In the reference implementation, this is not an issue because the wallet and chain functionality is tightly integrated. However, btcd intentionally separates the wallet and chain functionality into separate processes. As a consequence, btcd needs to be instructed which address to pay to in the generated block template’s coinbase. This is accomplished via the getworkkey option which can be specified multiple times. When there are multiple addresses, they will be rotated through at random when creating block templates. Block template creation is an intricate process that involves prioritizing transactions based on factors such as their fees per kilobyte, value, age of inputs, and byte size. Additionally, the code has to ensure that the selected transactions don’t run afoul of consensus rules. Some examples are exceeding maximum signature operations per block, exceeding maximum block size, not being finalized, and having dependencies which are not already in the block chain or earlier in the block being constructed. By default, the block template created by btcd contains a configurable area which includes transactions that are considered high priority. Transactions which consist of large monetary amounts, old inputs, and small byte sizes have the highest priority. Among other things, this helps ensure low-fee transactions that have been around for a while eventually rise in priority to the point they are more likely to be included in a block regardless of outstanding transactions with higher fees. Once the high-priority area is filled, or the priority falls sufficiently low, the transactions are re-prioritized from the highest fees per kilobyte to the lowest in preparation to fill the next area. The next thing that happens depends on whether or not there is a minimum block size configured (there is not one by default). If unconfigured, the block template generation is complete as soon as the transaction fees fall below a minimum threshold that is deemed too low. 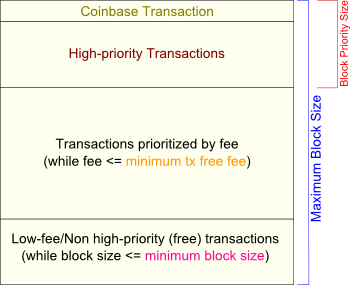 If configured, transactions will continue to be selected in descending fee order until the minimum block size is reached. At any time during this process, the block template generation is complete if there are no more transactions or the maximum block size is reached. As previously mentioned, when a getwork call is made without the optional data parameter, it acts as a request for work. As you might have noticed from the overview, one of the interesting properties about the getwork RPC is that unlike most others, it maintains state between calls. This is necessary because the actual transactions which are selected to form the block template are never provided to the caller since they are incorporated into the merkle root hash. This means they need to be cached for retrieval later when the caller eventually submits a solution. Since there will usually be a lot of outstanding block template variations before a solution is found, each variation is efficiently cached by its merkle root with a pointer to the original block template and the mutated coinbase script which contains the incremented extra nonce. This provides enough information for the block to be reconstructed based on the data submitted by the caller in the Getwork Submission. Finally, when getwork is called with the optional data parameter specified, it is treated as a submission of a valid solution. Adding support for getblocktemplate is a high priority for us (Issue #124). Our first goal is to implement and release the getblocktemplate fundamentals (BIP0022) and then later add support for the more advanced getblocktemplate features detailed by BIP0023. Also, we are looking for miners with ASIC mining hardware that are willing to incorporate btcd into their infrastructure. So, if you are interested, feel free to contact us to discuss options.